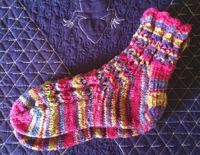 My AdventuresHome » “Rose Ribs” Socks! 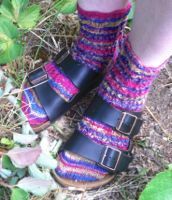 I’m still learning about knitting socks. So far, I’m liking the challenges they present. 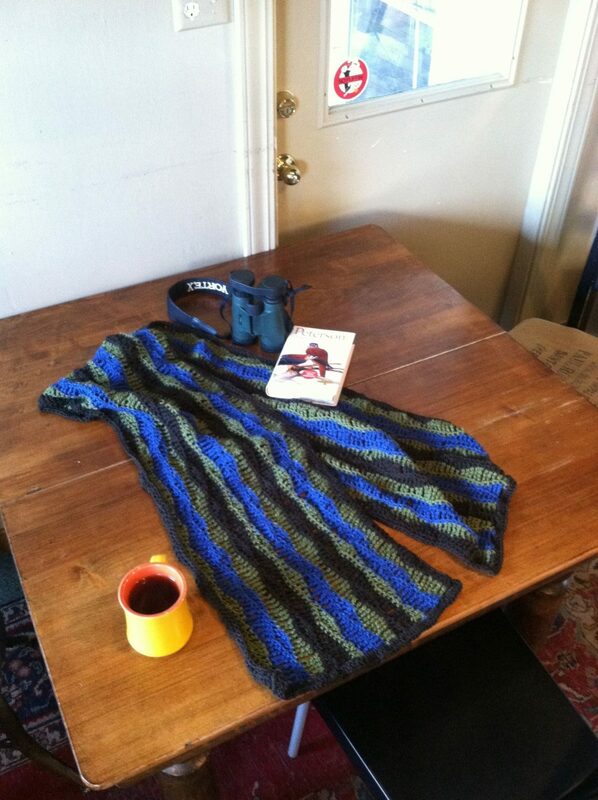 My most recent practice was with a pattern called “Rose Ribs” designed by Evelyn A. Clark from Ann Budd’s Sock Knitting Master Class. I used a skein and just a smidge more of a wool sock yarn I found on clearance two years ago, Red Heart’s Heart and Sole, a superwash wool and nylon blend made in Italy. It’s a sturdy, super fine yarn that was comfortable to knit. When I bought it, I wasn’t so sure I liked it, but it was cheap and I reckoned if I didn’t like the socks it made at least I wouldn’t be out much cash. Happily, it turns out the colors striped up cheerily. They may not go with much I own, but do they really have to? The hardest part of sock knitting has always been getting the size right. This time around, I got the first one wrong again. I knitted my first too large; a weeks worth of evenings passed through my mind in a sort of rapid rewinding as I unraveled it. The up-side of re-knitting is that I get a chance to get to know the pattern…really, really well. That paid off for me as I started in on my third one, which was the one that’ll make the pair. I had the pattern so well memorized by then I didn’t need to count every row or even look up the changes as I worked. It took me just two evenings from start to finish, half the time it took to finish the second and about a quarter the time it took me to finish the first.